These photos of Pagan Pride, which took place last weekend, were taken by Mani Navasothy of Pagan Federation London. "I think the turn out, despite last minute confirmations, was 150-plus judging by the look. There were so many journalists and press photographers and bloggers... so the news is spreading even as we speak! It was a fantastic bonus to have Jeanette Ellis [former organiser of Pagan Pride] turn up and lead the parade with Geraldine of Atlantis Bookshop [who organised this year's event]. "It was a great honour to be knighted (along with Geraldine, Mary Ranz and Arturo) into the Order of the Ravens by Jeanette, for services to Beltane Bash [a pagan festival that normally takes place in May]. "Geraldine of Atlantis Bookshop has already said next year we're going to make it bigger and more organised... we want lots of pagan groups to join in, and with all your group banners and flags.. and wonderful robes, cloaks and tribal costumes. We want Morris Dancers, more drummers... and even perhaps the return of `Giants'. PF London is going to get more involved.. and of course we want Jeanette back again in the parade with the Ravens!" The photo at the top shows Jeannette Ellis, Jeremy Morgan and Marcus Turle Lee. The photo right shows Mani with friends. Both pictures were taken by Mani. Oh sounds good! 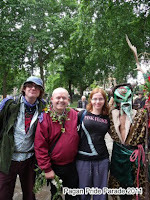 Wish they did pagan pride up my end - there's loads of us! 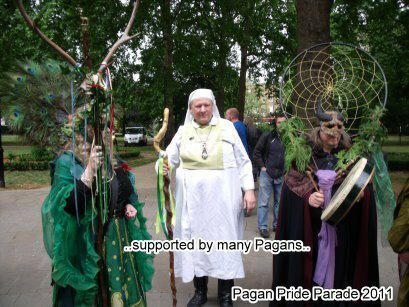 I have intended to join the Pagan Pride Parade for the last couple of years but for various reasons in the past, could not. However I was determined to join it this year and could have joined it had I been aware of the change of plans at the last minute - I thought it was on the Monday but it had moved to the Sunday. It was hard work finding out about it online and I was reading conflicting things. James - I sympathise! I thought it was on the Monday too until only a few days before the event. I'm not sure why it was changed. Hopefully next year's event will be better advertised.